Horace Fogel (March 2, 1861 – November 15, 1928) was a Major League Baseball manager. In 1887, Horace was the manager for the Indianapolis Hoosiers. His record was 20-49. In 1902 he was the manager for the New York Giants with a record of 18-23. 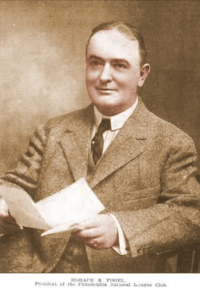 Fogel was also the owner/president of the Philadelphia Phillies from 1909 to 1912. As owner, he was banned in 1912 for publicly asserting that the umpires favored the New York Giants and were making unfair calls against his team. Fogel was born in Macungie, Pennsylvania and died in Philadelphia. ↑ Okrent, Daniel (1988). The Ultimate Baseball Book. Boston, USA: Houghton Mifflin Company. p. 352. ISBN 0395361451.